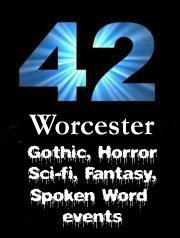 On Wednesday January 28th, 42 Worcester will celebrate its 42nd event. Founders Glenn and Angela James opened the doors at 42 for the first time in March 2011. Since then, 42 Worcester has gone from strength to strength featuring spoken word performances from local writers and beyond. Andrew Owens will be hosting this special event at Drummonds, Worcester, home of 42 Worcester for the past three years. Doors open at 7:00pm for a prompt 7:30pm start. Come and celebrate this momentous occasion with us. All are welcome and entry is free.